When searching for a nearly full-range speaker system at or below $1000, the basic question is: Do you choose a single-box speaker or a subwoofer/satellite system? Will a sub/sat system outperform a comparable floorstander? Does a sub/sat system integrate as well or sound as dynamic as a speaker with all of its drivers in one box? Sure, there are lots of sub/sat systems that are pleasant-sounding and non-fatiguing, but how many of them offer a palpable midrange, extended grain-free highs, and tight, non-bloated bass? 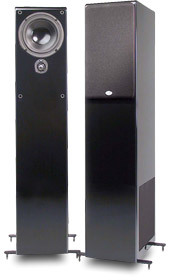 While I personally believe there are sub/sat systems that may be able to claim such performance, Im sure that most audio lovers would find the all-in-one floorstander a more attractive alternative. Go out and start comparing. Youd be surprised what $1000 buys you in loudspeaker performance these days -- and a prime example is the NHT ST4. NHT is justifiably recognized for its well-designed two-way systems, but the company known as Now Hear This has also produced three- and four-way designs for some time now. Their SuperTwo, VT series, and flagship 3.3 constitute some of the most affordable and sonically transparent floorstanding loudspeakers available. As the successor to the SuperTwo, the ST4 aims at keeping that well-earned reputation alive. The ST4's strikingly glossy, black-lacquered ported enclosure contains a single 1" aluminum tweeter, 6.5" polypropylene midrange and 8" high-excursion, side-mounted woofer. Now for all those skeptics who believe this whole side-mounted-woofer thing is more of a gimmick than functional benefit, NHT assures me that it does contribute to the speakers performance. According to the manufacturer, in addition to providing a narrower, more resonance-resistant front baffle, side mounting the woofer presents the listener with flatter bass response by keeping the woofer closer to the floor. Words are, however, weak unless experience backs them up. So I tucked away my notes and proceeded to let the speakers, er, speak for themselves. The ST4s were well packed and a breeze to uncrate and set up. Spikes and steel outrigger-stabilizer bars come as part of the package -- they allowed the slim but solid towers to stand securely and attractively in my living room. Those who fret about hardwood floors should fear not, for NHT was also thoughtful enough to include unique dimpled metal disks to place between spike and floorboard -- a considerate touch. The one glaring inconsistency that I felt diminished the ST4s' elegance was their cheesy binding posts. In fairness, though, NHT's philosophy plainly states that, to keep costs down, money is only spent if the end result contributes to an improvement in the sound. Therefore, from a practical standpoint, Im guessing that sturdier posts didnt make any sonic difference to NHTs ears or oscilloscope. What did seem to make monetary sense was a feature related to the black "nicotine-patch" located on the ST4s rear baffle. Instead of simply ferrofluid cooling the tweeter, NHT has gone one step further and coupled the tweeters housing to this external black patch, which in turn pulls heat away from the tweeter and the enclosure. NHT considers this approach better not only for the music, but also for the speaker's longevity. And that, I must say, is another considerate touch. Referring to the well-written manual, I found the ST4s were designed to sound their best using the tried-and-true 1.5-to-1 rule. So I measured and moved until the speakers stood six feet apart and nine feet from my listening position with the woofers facing one another on the inside walls of the speakers. In addition, I toed the speakers in slightly and repositioned them to within three feet of the rear wall. This gave me pretty even bass response. I drove the ST4s with my Harmon/Kardon AVR-510 receiver, fed by a Panasonic DVD-A120 DVD player, connecting the two with BetterCables Silver Serpent digital coax. NHT does not recommend any extended break-in time. All the company asks is that you allow adequate time for the speakers to acclimate to their surroundings' "ambient temperature." Any conditioning applied beyond this shouldnt, in NHTs opinion, make much of a difference to overall sound quality. This turned out to be pretty accurate. The only aspect of the speaker that seemed to improve after several hours was its midrange, which sounded ever so slightly smoother. "Oh, my! These black boxes do speak!" Seamless was the first term that came to mind, followed by smooth and well balanced. The level of detail coming from the towers was also quite impressive, as was the image that spread around and between them. Ambient music like Deleriums Poem [Nettwerk 46629] brought forth an effervescent, yet highly controlled sonic quality that drew me into tracks like "Terra Firma." Midrange had nice weight and presence, while the bass was full, tight and completely boom-free. Putting any concern over side-firing woofers completely to rest, the ST4s' bass was well integrated. I had always felt that Poem was an excellent recording, but the ST4s proved to me how high a production level the songs adhered to. Be warned, however: If, like me, you enjoy the effortlessness of well-produced percussion, the ST4s will grab hold of your senses and make you their friend. Tracks from Doudou Ndiaye Roses album Djabote [Real World/Carol 2340-2] were open and lush, exhibiting just the right amount of ambience and detail. On the NHTs, this live recording, made on the shores of Goree, Senegal, made me feel as if I were right there, breathing the sea air and soaking in the truly wonderful drum work of over 50 perfectly synchronized musicians. I was seduced into sitting in the darkness, embracing the experience without a worry in the world. Oh, the power of music! These speakers are transparent. Stings Brand New Day [A&M Records 4432] nicely illustrates contrasts between delicate percussive and big bass sounds, making the ST4s' ability to present "A Thousand Years," "Desert Rose," and "Ghost Story" an extremely revealing experience. There were moments, however, when I felt the NHTs imparted a slightly congested quality to an otherwise well-produced album. In addition to their obvious tonal balance, the ST4s' dynamics proved to be quite exciting. Christian Badeas performance of Saint Sa�ns Third Symphony [Telarc CD-80274] did deliver good impact. The NHTs handled the complex crescendos and dramatic horns in the opening eight minutes of the first movement extremely well, but didnt have a prayer when it came to reproducing the subterranean organ found at the ten-minute mark. Given NHT's pride in building speakers that get out of the musics way, it was only a matter of time before I chose a recording that would show the ST4s' unforgiving nature. In this case it was The Cranberries To the Faithfully Departed [Island 234-2], which made me wince a bit. The opening Theremin effect on "Bosnia" had an almost unbearable edginess, while Ms. O' Riordans overly sibilant vocal brought about a grimace on every high note. But this is the sound on the recording, so I can't fault the ST4s! For close to a year, Ive owned the $1400 Newton MC300/P1000 bookshelf speaker/subwoofer combination from Cambridge SoundWorks. As with most sub/sat systems, placing the CSWs took several nights of fighting with bass localization, blending and room nodes. The ST4s, on the other hand, demanded little more than a few hours worth of tweaking to sound full and even. However, the ST4s were much less appealing to my wife, who felt that these high-gloss floorstanders took up too much floor space in our rather small family room -- from a practical point of view, I tended to agree with her. The MC300s ability to be wall-mounted and the fact that the P1000 could be placed out of sight make any amount of floor space given over to loudspeakers seem extravagant. Sonically the MC300/P1000 and ST4s are quite different. The P1000's bass response had a rounder, richer quality to it, while the NHTs were punchier and more detailed. The NHTs also had a leaner, yet extended, quality, which served the music better. While the MC300/P1000 combo affords even flawed recordings an enjoyable presentation, the NHTs are much less forgiving and present a bright or dry source just the way it was recorded. The NHTs simply possessed more detail and extension up top than the CSW system, which led me to a surprising conclusion. Despite the fact that small satellite speakers typically image better than larger speakers, the ST4s imaged more precisely than the Cambridge SoundWorks system. But the most apparent difference between the two systems was the perceived dynamic range. The NHTs had a quickness that bettered the CSW setup. Ironically, the P1000 seemed to offer a bit more speed than the MC300 satellites could muster. In a further surprise development, pairing the ST4s with the P1000 sub actually yielded the best sound of all. The snap of drums, the crackle of explosions, the deep hum of a starship's engines all seemed more dramatic coming from the NHT/CSW combo. A good subwoofer could improve even the extended bass response of the ST4s -- and the extra weight and heft of a true subwoofer are awfully attractive, even for full-range loudspeakers. While Im sure many $1000 sub/sat systems would satisfy the average listener, in my experience, most sub/sat combos simply can't approach the balance and transparency of these NHT towers. Given adequate space and decent ancillary gear, these speakers will reveal details on your favorite recordings that you would have never guessed were there. That said, they'll also reveal the shortcomings in the gear you connect to them. Hook up an inexpensive receiver with lean sound and the NHTs will make no apologies for it. Listen to a recording that lacks dynamics and refinement, and that's exactly what they'll report. Bottom line: The NHT ST4s arent for everyone. Listeners who have a mountain of poorly remastered CDs would probably benefit from a warmer-sounding speaker with a more laid-back personality. Those who listen to well-produced jazz, classical and many newer recordings, or those who simply need to hear every nuance within the music, would do well to consider NHTs marvelous ST4.